73”,79”,81” or 83” high x 48″ deep x 48″-72″ wide Roll Out Horizontal Sheet Rack. New. Shelving with retractable drawers. 5-8 roll out shelves per unit. Option to add or increase number of shelves in future. 5,000 drawer capacity. Units come in starter units or add-on units. Ideal for storing sheets of steel, plastic or wood. *Roll out sheet metal storage racks are available in a variety of lengths, widths and heights to fit your needs. 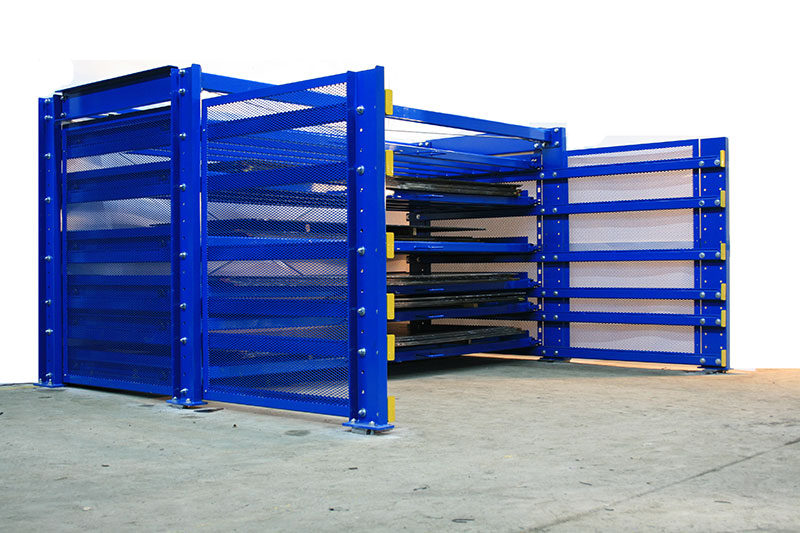 Categories: Warehouse Racks, Sheet Racks, Specialty Racks, Roll Out Racks. Roll out sheet metal racks can totally transform your operation. These racks can improve your storage density and efficiency. They can also greatly improve the safety of your employees. We know as warehouse managers, you are always concerned with maximizing your space while also maintaining a safe environment. Roll out steel storage racks are designed to hold up to 5,000 pounds of materials. You wouldn’t want to put your heavy-duty material just anywhere. This system is extremely durable and secure. You can trust that your inventory and your personnel will be kept safe with the roll out sheet rack system. This system will help you maximize your organization. The retractable drawers make it easy to quickly find what you’re looking for without having to unload tons of material. Not only is the roll out sheet storage rack system a huge timer saver, it’s a space saver, too. By using drawers and shelving to store your products, you’re able to free up floor space.